The Chicago Auto Show runs February 9-18 at Chicago's McCormick Place and I will be "On the Beat" as usual. 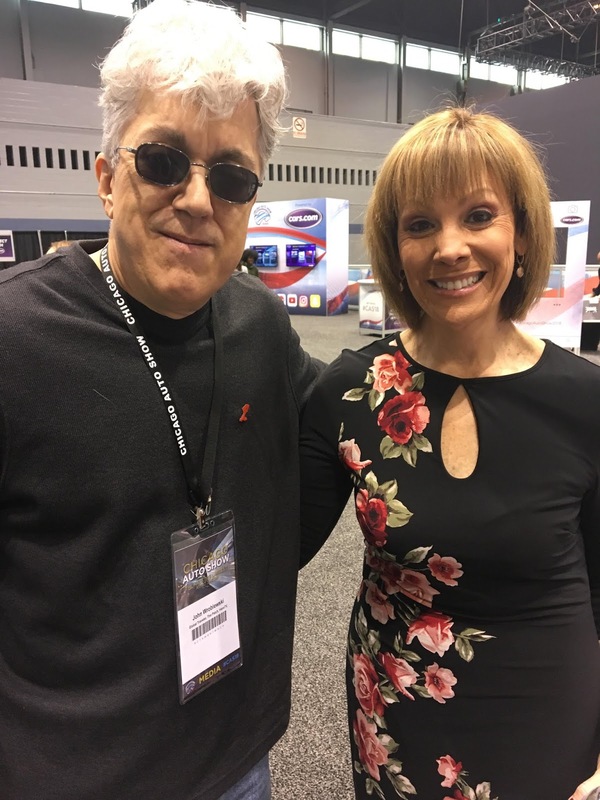 Since vehicles are not the only part of the auto show, I am featuring some of my favorite celebrities from last year's show. ABC TV Chicago's Roz Varon was one of the people I most wanted to meet. I had previously worked with Roz on a few different projects in my past life at Lerner Newspapers, but we never actually met. I wrote about one of those projects at Roz Varon Salutes Literacy. Roz was one of the many celebrity spokespeople for a ad series I ran promoting literacy. Roz graciously accepted my request and her ad was one of the most popular in the series. Roz's battle with cancer is widely known and her courage and strength has served as an inspiration for all. I witnessed some of this as I approached her at the CAS. Several woman were talking to Roz about their similar battles. The love seen was powerful and almost overwhelming. Roz was very loving with them, giving them warm hugs before moving on. My meeting with Roz was far less serious, but she gave me her time and consideration, just the same. I presented her with another copy of her ad from way back just to remind her. Of course, she remembered and thanked me for including her. We talked for a few minutes before the line of fans forced me to end our chat. Thank you to Roz Varon for her time, for being so sweet and for serving as an example of grace, strength and perseverance in the awful battle against cancer. Thank you to the fine folks at the CAS for the hospitality. Go to ChicagoAutoShow.com for more info. You can also follow the Chicago Auto Show on Facebook and the Chicago Auto Show on twitter for updates, scheduling and more info. Roz Varon and me in Chicago, IL-February 2018. Roz always seems to be such an amazing woman!!! Go Roz! Glad you got to meet her.